Fact: I will systematically read everything Patrick Ness writes because he owns a piece of my heart. Fact: I am always afraid that my next Patrick Ness book will disappoint me, because how could ANYONE wow fickle old me consistently? 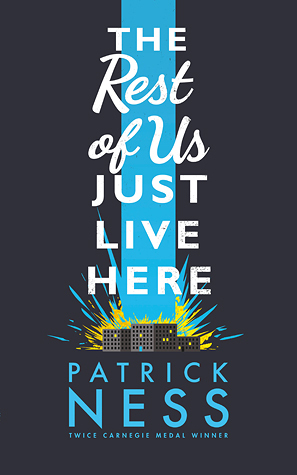 Fact: Patrick Ness delivers once more with The Rest Of Us Just Lives Here. A book largely devoided of magic and grandeur, but so completely audacious and heartbreaking and magical anyway. One of them showed me a poem about how we’re all essentially alone. As if they’re not the biggest clique of togetherness there ever was. Each chapter in the book begins with a flash to the indie kid’s storyline – you know the ones: Destined (with a capital D) for larger than life stories: they hunt down vampires and deities and immortals, saving the world and dying in the process. The book points out how laughably mundane and predictable their crazy lives are: from their supernatural lover to the constant betrayals that rock their world. In fact, the indie kids and their lives are so predictable that they’ve repeated the same story for generations in this town. Even their quirky names such as Finn or Satchel are laughably monotonous. I love the little references to the fact that YA protagonists always seem to be stuck in a different era, where teens apparently appreciates poetry and never uses the internet. I laughed out loud as familiar tropes are mocked: “then he tells her she’s beautiful in her own special way and that’s when she knows she can trust him”. While I’m primarily a reader of YA genre fiction, I thought Patrick Ness did a great job with this section of the book. While genre fiction is filled to the brim with the greatest and latest supernatural creatures, what they tend to lack in is an emotional core or diversity. But here, we have teenage years in all their ugly and messy glory, as presented by our colourful cast of character. There’s Henna, who will be whisked off to Central Africa on a missionary as soon as she graduates highschool. There’s Jared, who loves boys and is adored by cats (he’s basically your modern day Bastet – in fact, he pronounces himself as 3/4 Jewish and 1/4 God). Then there’s the beautiful sibling: Mikey who’s struggling with his own head, and Mel who’s still recovering from an eating disorder. This book highlights all of their internal struggle, while pairing it with the all too familiar fear of graduation. I will be honest, my own high school life was pretty charmed and vanilla – so the only thing I could wholly relate to is the fear of separation from my friends when graduation rolled around. However, with such a diverse cast, I am certain many teen readers could relate to this book on a more emotional level. We share our craziness, our neuroses, our little bit of screwed-up-ness that comes from our family. We share it. And it feels like love. I love Mike and the relationship he has with his siblings, especially Mel, so goddamn much. Mike and Mel are just so mutually supportive. Despite their own weaknesses, they always aim to be strong for one another, to pick the other person up when one of them stumbles. They remind each other that someone loves them, that they matter, even if crippling despair and desperation may be telling them otherwise. I love how much they adore their audacious and bubbly younger sibling: Meredith. I also really enjoyed seeing parent figures that were not pushed to the sideline. In fact, Mike’s mother played an active role in shaping her children, for better or for worse. She was never pushed out of the picture conveniently for the sake of plot development – in fact, her own voice became important in the story. There’s no linear plot, there’s no villain for them to overcome, there’s no conventional romance – basically, if you’re expecting a typical YA book you won’t get it. The characters are messy, their intentions while good, comes with questionable action. I wanted to shake them so many times – actually this is what made me love them. I would tell you to read the book anyway, though. I am the last person on Earth who would want to read about a bunch of boring kids – I’m a fantasy snob! BUT THIS BOOK IS AMAZING. Next ›Discussion: Is It Possible To Measure Blogging Success? OH HOW GOOD IS IT THOUGH??? I kind of feel like rereading it actually, except I’m this close to the end of high school that I’d probably bawl my eyes out about the friends who are moving away from me. (curse them!) Forget Jared, Patrick Ness is basically a god. I love this book so much and I want to hug everyone in it! I know, ending of high school is so difficult but I hope you’ll have fun at uni. And I agree, ever since I started following him on twitter I simultaneously love and fear him 1000x more! Nice review and beautiful illustration! I am actually kind of worried that I won’t like this one, but its Patrick Ness! He doesn’t disappoint 🙂 I’m glad to hear you liked it a lot 🙂 I gots to read this one sometime soon, but not before I finish the Chaos Walking trilogy! I think I want to make it my mission to read everything Patrick Ness has written. Ooh this is really interesting because I just read a review that criticised the diversity of the cast of not going deep enough. I’m thinking that structurally this sounds really really fantastic (satire = THE BEST) but I’m a little hesitant on whether I’ll be convinced as I flip through the pages. Thanks for the review, Aentee! I can certainly see why the other reviewers would think that, as the book mainly dealt with Mikey instead of Jared or Mel’s problems. I didn’t mind it because he made it very clear earlier on in the novel that this was ‘his’ story. I hope you’ll enjoy it if you do decide to give it a go! I’m planning to read it and your review just made me want to read it even more! Thanks for sharing, Aentee. The cover is also adorably cute, anyway. Just read my first Patrick Ness book a few weeks ago (A Monster Calls). Maybe I’ll need to make this one my second. This sounds like a riot, even without a definitive plot line (I suppose that’s the point?). Thanks so much for the reviews, I love Patrick Ness, so I’ll definitely be picking this one up. It’s more a slice-of-life type book rather than one that has a definite plotline but you’re right, that’s definitely part of the charm. I hope the Patrick Ness magic will continue to wow you! I always find it refreshing to read a YA book that actually features parents that are involved in their children’s lives. One of the great things about Patrick Ness’ work is the realism in his writing and portrayal of humans. I can’t wait to read this. Yes, Patrick Ness definitely has my heart! I love his portrayal of emotions and relationships – especially the difficult ones. This book is quite large on family, so I think you’ll love it! Thank you so much! I am glad you are pumped for the book and I hope you love it as much as I did! This book was insanely good. Loved it so much! I love love loved this book. I totally get what you mean about wanting to give the characters a good shaking. Mikey’s insecurity got in the way of so much! I was constantly wanting to tell him how well he could be doing if he just got out of his own way. But that is otherwise known as being a person. I also have to give some love to Call Me Steve. He was very sidelined, but in his small appearances he came over totally likeable. I think Mel made a good choice, there. I’ve seen mix reviews of this book, I’ll see how much I enjoy The Monster Calls before tackling this one 😀 Regardless, gorgeous artwork. A Monster Calls is a perfect starting point, I think if you love that one, you will also love The Rest of Us! I always love your artwork girl! And I also love how you demonstrate every single important piece to this book which just makes me want to slap down everything I’m doing and read this book since I’ve been seeing this gorgeous cover everywhere and this author’s name is flying around like nobody’s business. Thanks Keionda, I don’t actually draw them though, just so you know they’re from Creative Market packs! I will endorse your desire to slap everything down and read this, as I think you should totally do JUST EXACTLY THAT ❤ Patrick Ness is wonderful, you need to get aboard the hype train haha. *whispers* I’ve never read anything by Patrick Ness. I know I should probably solve this problem, haha. Which do you recommend? I have More Than This and The Knife of Never Letting Go. Great review! I’m still excited for this book. Glad you enjoyed this one Aentee! It wasn’t for me, because I just wanted to know what the indie kids were up to instead of the boring life of Mike. But then again magical realism doesn’t really work for me! I’ve had this book on my to-read list for ages. I’ve never read anything else by Patrick Ness but this book sounded so interesting that I just couldn’t resist. I’m glad you enjoyed it so much, great review, I really love your artwork as well! This book is really wonderful ❤ Thank you! I hope you'll enjoy it! My graphics are all made with the help of Creative Market and Freepik, I don't draw AT ALL hahah. I actually have yet to read More Than This! I am a bit ashamed to preach on about being a Ness fan haha. I think if you love the ‘ realistically, heartbreakingly, and hilariously all at the same time’ part of his writing you will ADORE The Rest of Us!! Patrick Ness has always been an intimidating author, but based on your review, I feel like this could be the book that will stave that wariness away. Great review ! I haven’t read anything by Patrick Ness yet, but I do want to ! This book is just screaming something I would adore. It seems awesome and unique and I love the way it’s poking fun at “the chosen one” kind of books. I mean, yes I enjoy those books, depending on how they’re done, but I am not against some humor about the ridiculous elements. This seems like it’ll be really funny and a standout read- I really hope it ends up being that way!- but it also seems incredibly genuine. Like, it focuses on the humanity in it’s MCs, and everything I’ve heard about that element just makes me so, so eager to delve right into it. I’m so sick of reading about books where the heroine is always such a special snowflake. It’s always so unrealistic, you know? Which is probably why I’m looking forward to this book so much – it features a protagonist we can all really relate to and understand – someone who isn’t necessarily anyone important or special, but affects you all the same. I love the idea that this book takes. Being satirical to the congenital story lines of YA novels… BRILLIANT! You’re review was absolutely stunning as usual, Aentee! I meant to say CONVENTIONAL not congenital 😂 Auto correct, damn you. This is actually my first Ness book, and I can certainly say that I am 100% keen to read more of his books, especially since they come so highly recommended! And if they’re anything like this in writing style or content, I will fall in love. I just know it. I was so enamoured with how Ness introduced these completely contemporary characters and storylines and lives … and weaved them into a paranormal world. 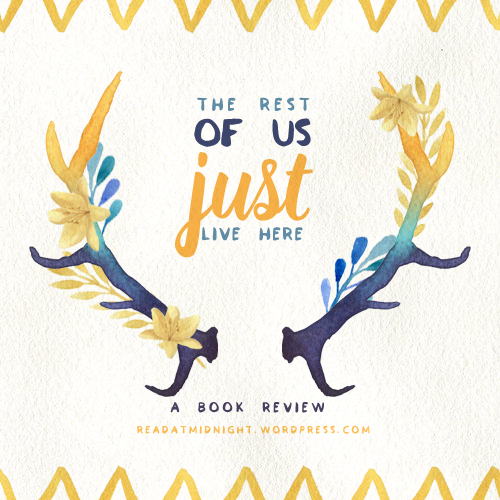 We (or at least, I) never really think about the characters outside of the special snowflake circle of friends in paranormal books, and how they might live. So it was beyond awesome to see Ness explore this in such a great way.